Every customer when he walks in to an establishment is wondering whether he would get what he wants. Would they have my choice of colors, would they have different sizes to choose from, hope it is not exorbitant. In other words, “would they meet my requirements?” Satisfaction starts with the first response to a customer request and this process is set in motion when you have a positive answer to his query. “Yes we have” “Yes we can”. “Surely we could work it out”. With such a response you are opening the doors and inviting him for business. From here on come the various other facets in customer service. But to get there you need to beckon him and this is achieved with a ‘Yes’. So if a customer asks you if you have or can do something for him, the answer is always ‘yes’, provided the request is somehow related to your business. It is ‘yes’ even if you can’t immediately figure out how to meet it or what it might cost. ‘Yes’ is a very powerful tool in successful customer service. ‘Yes’ is a sign of positive response. ‘Yes’ is sending the signal to your customer that his request or command will be complied with. It is a confirmation. It is affirmative. Imagine a customer walks in to your establishment with an enquiry and your answer is a polite ‘no’. What you have now done is turned him around and sent him to competition. Should they cater to his request you have lost him forever. Mr. King walks into this restaurant and wants a take away meal. He is trying this place for the first time on recommendation by a friend. For a quick take away the employee guided him to the buffet section. King walked around and narrowed his choice to a chicken curry and a traditionally prepared fish curry. Both these items were equally appetizing and priced the same. Since he was to eat alone he could not consume two full portion of the curry’s. He, however wanted to get an experience of both and hence requested the employee walking along with him if he could give half portions of each. King thought this was fair as he could try out two dishes and the restaurant also was not at a loss as both items were of the same price. Unfortunately the restaurant employee said that this was not possible as it was against the rules. They would have billing problems. King, wondering at their logic requested him to speak to his manager. Quickly came the reply “I am the manager”. A bit surprised King tried to reason but eventually gave up thinking to himself that the food maybe good but they did not understand his requirement nor had flexibility in their catering. He thanked the manager and walked away. Had the manager to accommodate and give two half portions, he would have let King experience both dishes and given him the opportunity to come back for more business. Since both were the same price he could have billed it against one item. Now he not only lost King’s business but also from potential customers who might hear King’s experience. A customer normally has an enquiry that is related to your business. It is possible that it might not match your offering to the tee. That’s where lies the challenge in customer service. Every mismatch in request to offering, gives you the opportunity to try and meet it. All such encounters are learning experiences. Customers with special requests are helping you open new avenues for additional service. They help you improve and better your business potential. He is feeding you with ideas of extending this additional service to other customers as well, resulting in more satisfied customers. Every ‘yes’ to a special customer request has been the reason for the evolution of various businesses. Complying with such requests has led to new service opportunities giving a clear edge against competition. A request similar to King’s would have led to the birth of “Combo Meals”. To grab such opportunities and grow, you need to ‘yes’ your customer. 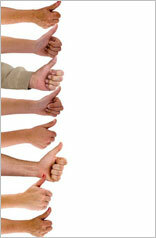 The ‘Yes’ factor plays an even more important role with regular customers. A customer coming for the second or nth time to you but with a request different from the usual does so, with faith that you would do all possible to meet it. If this is somehow related to your work, then the response has to be a ‘yes’. It should be a pleasure to do something more for him. It might mean getting it from competition or directing him to one, as eventually you are helping him buy and meet his requirement. You are reinforcing his trust on you and telling him that you are always there for him. With a ‘yes’ your customer has faith that, you will never let him down at any cost. “Yes, but in a slightly different shade”, “Yes, it could be delivered in 3 days”, “Yes, we can tailor it to your request”. With every ‘Yes’ you are trying to retain a customer. Work on meeting the ‘Yes’ and you are satisfying him and in the process actually retaining the customer. Keep doing it and you are creating customers for life.